As much as we love the American Old West"
the very things we love about it are disappearing every day. 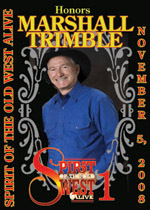 the Spirit of the Old West Alive"
Our first interview was with the man who has done the most to promote and preserve Arizona history in the last four decades, Marshall Trimble. 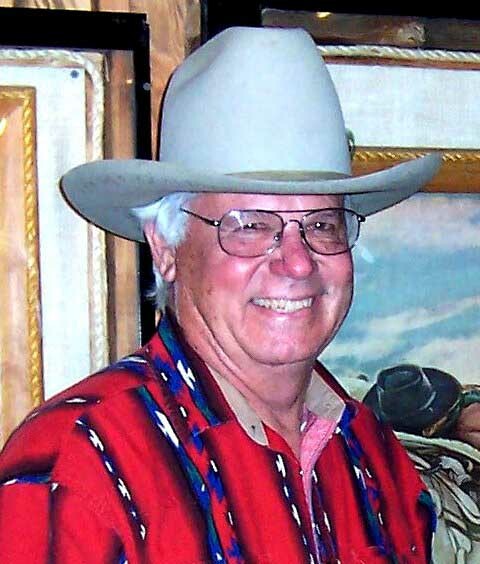 Born in Ash Fork, he has lived and taught Arizona History and is recognized as the leading authority and holds the position of Arizona State Historian. But how much do you actually know about Marshall? Come sit with us for an hour or two as our honorees tell us about their life and experiences. What is their greatest accomplishment? 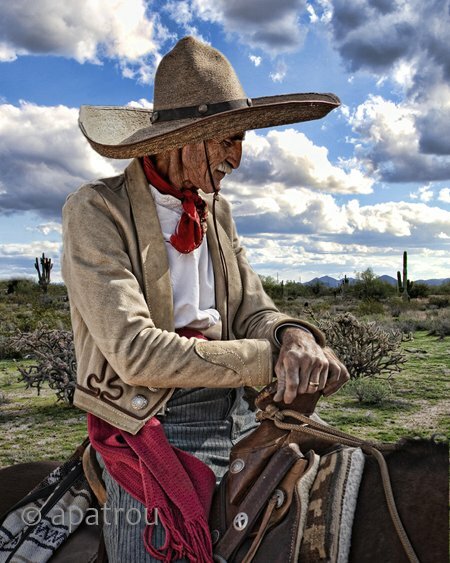 Hear about all of the interesting characters in Arizona history each honoree has met and his impressions of their significance in history. If you enjoy Arizona history this is a must see event! Oct 15th, 2010 Johnny "Hot Shot"
October 15th, 2010 LeeAnn Sharpe Writer and Publicist has worked with dozens of people to bring their story to life. 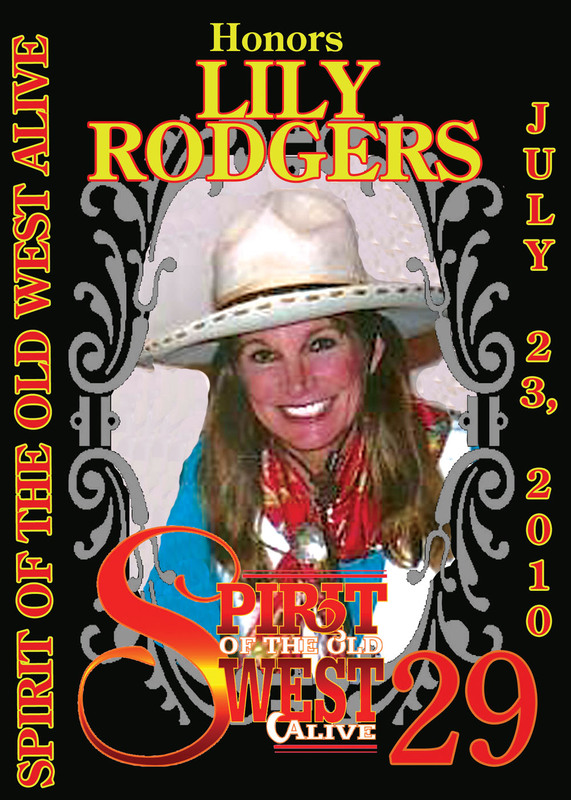 She has been a part owner of Champions of the Old West wild west show, participated in Branson's Cowboys, Heros and Friends at Polly Parton's DixieLand Stampede, served on the board of CMSA and ACMSA, Editor of The Rundown and Cowboy Mounted Shooting World publications, announcer for events including sharing the mic with country singer Lynn Anderson at Festival of the West. 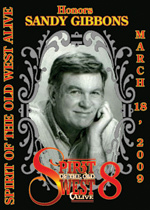 Active with Wild Western Festival and founder of the Spirit of the Old West Alive awards in 2008. 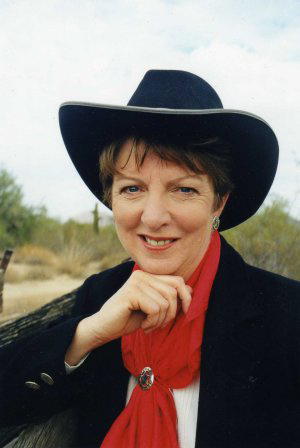 Bethany Braley, Executive Director & Publisher for the National Day of the Cowboy organization, is available for interviews or to speak to your group or organization regarding the history of this campaign and the challenges we face in achieving permanent passage of the Day of the Cowboy resolution. She has been working continuously on the effort since November 2004, and offers key information on how you and your community or organization may become actively involved in contributing to the success of this historic grassroots quest. 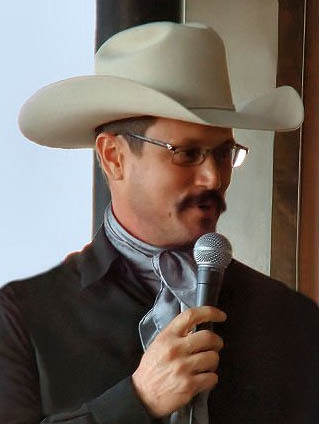 Email info@nationaldayofthecowboy.com to discuss public speaking opportunities you may have. October 15th, 2010 Johnny "Hot Shot" Tuscadero Mincks Wild West Show Gun spinner Johnny Hotshot brings way more than just gun ... and excitement of the Wild West Show like Hotshot Jon "Tuscadero" Mincks. 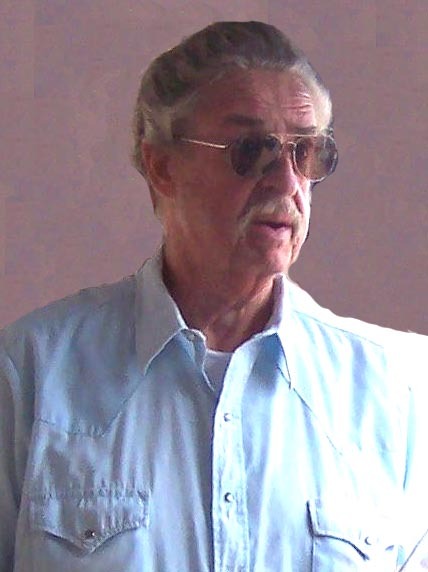 October 15th, 2010 Ed Faulkner Edward Faulkner is an American film and television character actor. He is most known for his roles in John Wayne films, including Hellfighters, The Green Berets, Rio Lobo, McLintock! and The Undefeated. October 15th, 2010 Ty Hardin Ty Hardin, born Orison Whipple Hungerford, Jr., is a former American actor best known as the star of the 1958-1962 ABC western television series Bronco. October 15th, 2010 Brad Zinn Brad Zinn is one of the most sought after comedy magic entertainers in his field. Brad's background in acting and comedy make his performances a cut above the average entertainer. Brad adds elements of storytelling, magic, impressions, audience participation, and music to make his act absolutely unique. October 15th, 2010 Chris Enss Chris Enss is an American author and screenwriter. 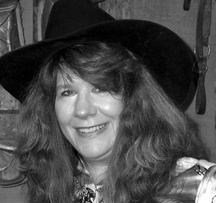 Enss has written more than 20 books on the subject of women in the Old West, and has collaborated with producer Howard Kazanjian on four books, including two about Roy Rogers and Dale Evans. 37. October 15th, 2010 Noel Neill Noel Neill is an American actress in motion pictures and television. She is best known as her portrayal of Lois Lane in the film serials Superman and Atom Man vs. Superman, and on the 1950s television series Adventures of Superman. In her teens, Noel was a popular photographic model. While Betty Grable's pin-up was #1 among GIs during World War II, Noel Neill ranked next! Miss Neill was often in westerns while under contract with Paramount, Monogram and Republic film studios. 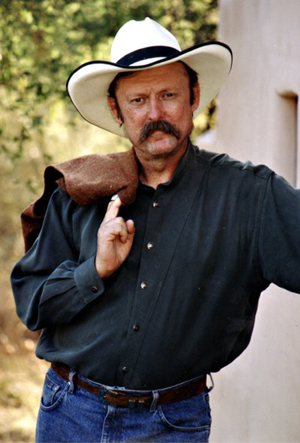 October 15th, 2010 Buck Montgomery Real Hollywood Stuntman and Professional Character Actor with Film & Stage credits that include: The Sacketts, Long Riders, Deadwood, Tombstone, Pale Rider, Young Riders, Quick & The Dead, Back To The Future III, Barbarosa. September 24th, 2010 Herman Dickson Also honored is Herman Dickson. Herman is the world's leading authority on Lon Menargee and A-1 Brewing Company artifacts, both a major piece of old west history. Herman will share his experiences and wow the crowd with his latest discovery. 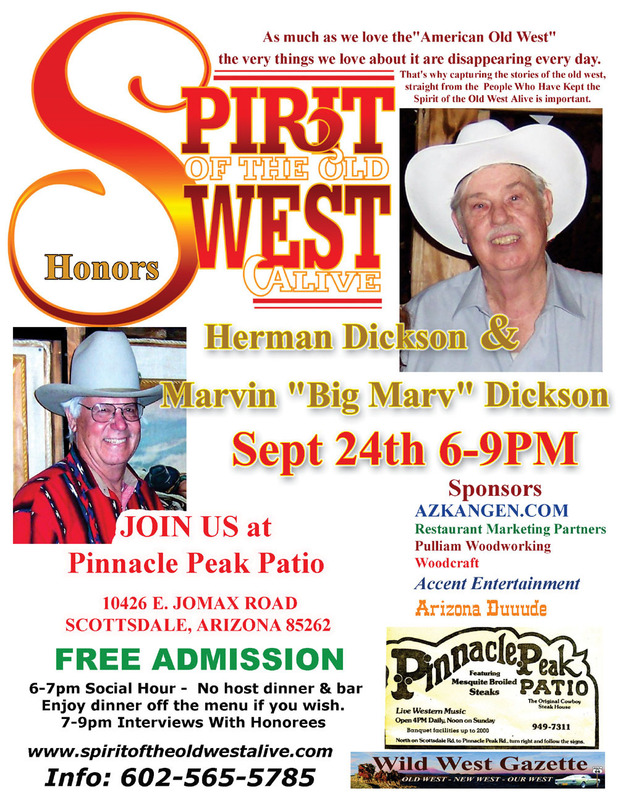 September 24th, 2010 Marvin "Big Marv" Dickson Big Marv has been the head cook at Pinnacle Peak Patio for 50 years! His history parallels the growth of Phoenix and the story of an era. Everyone visiting the Valley of the Sun went to PPP for dinner as an iconic venue in the north Valley desert. 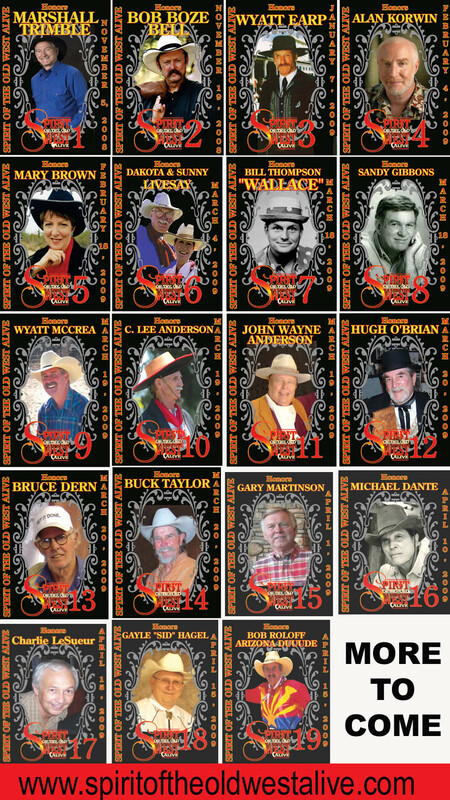 Marv has stories and pictures with every major celebrity including the likes of Waylon Jennings, Jessie Coulter (still a regular guest), President Bush, Liza Minelli, Stephen Spielberg, Michael J Fox, Amanda Blake, the Petty Racing Family, Wayne Newton, Herb Drinkwater, Joe Jackson, and more. Sports, politics, actors, you name it they went to PPP. Joe Bethancourt was a local institution in the Phoenix area. 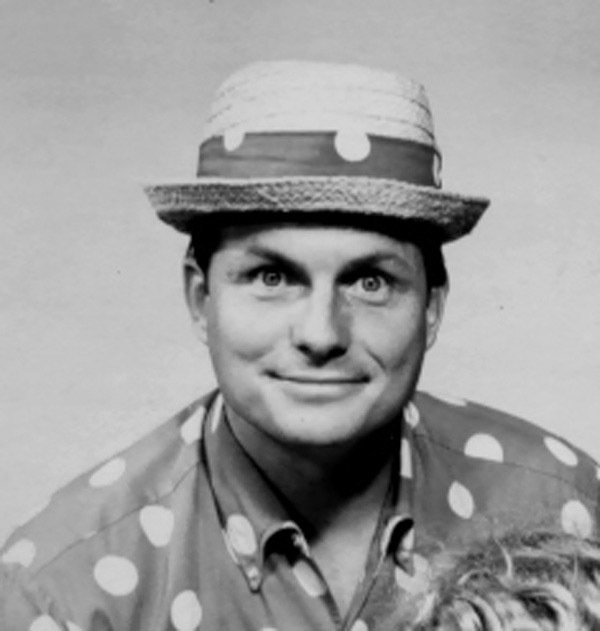 For many years he played at Funny Fellows on 19th Ave. and Bethany Home Road as a house musician. With his dozens of instruments, Joe could weave a story musically like no one else. 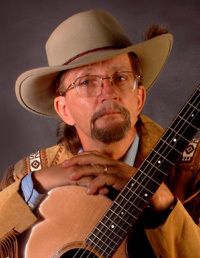 His understanding of the roots of folk music and his ability to play almost any instrument made him a master at subtle nuance in every piece. He could bring you to tears and then turn around and make you laugh so hard your tummy hurt. 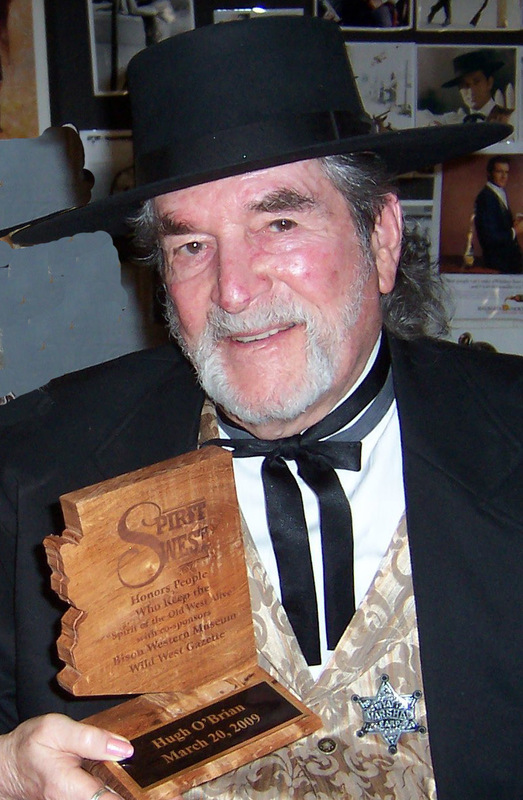 When Joe accepted the Spirit of the Old West Alive award at the Macayo's restaurant on Central Avenue, he shared several songs and stories with the crowd of about 50 gathered. It was truly a special evening and one of the most well-deserved awards to a man who truly kept the Spirit of the Old West Alive through his music and his life. 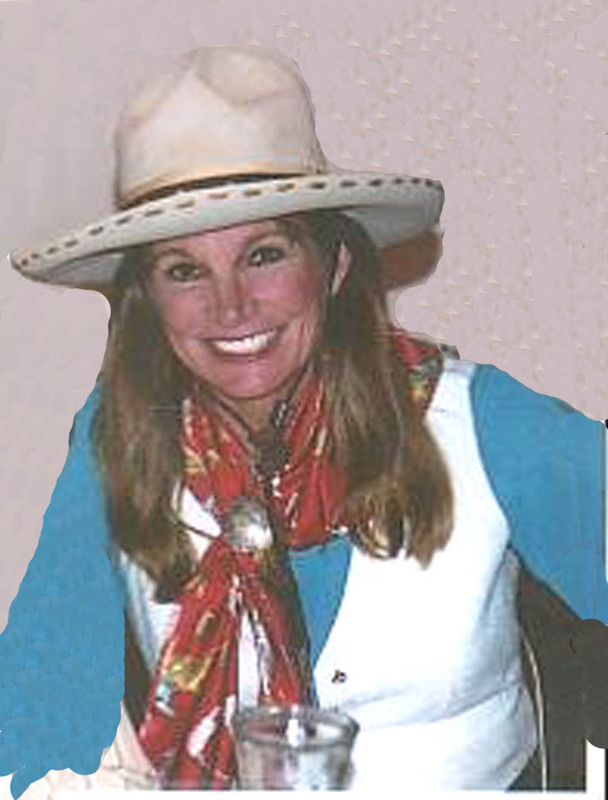 The first lady of the Cowboy Mounted Shooting Association, Lily is often the best ambassador for the sport as well as the most prolific photographer. In addition she has led the women in the sport with her competitive nature and excellent horses. Always with a smile Lily dresses in the old West style every day of her life and truly keeps the Spirit of the Old West Alive. Gunsmith & gun coach to the stars. Publisher and expert on the west. As publisher of the Wild West Gazette www.wildwestgazette.com Sid Hagel has reinvigorated a love for the history of Arizona and the old west. Bison Homes CEO and host to the Spirit of the West Awards from November 2008.Gary has built an exciting collection of art and artifacts for the Bison Western Museum which he will now be moving from Scottsdale to a new home at the Grand Canyon where hundreds of thousands of visitors will enjoy the western art experience. 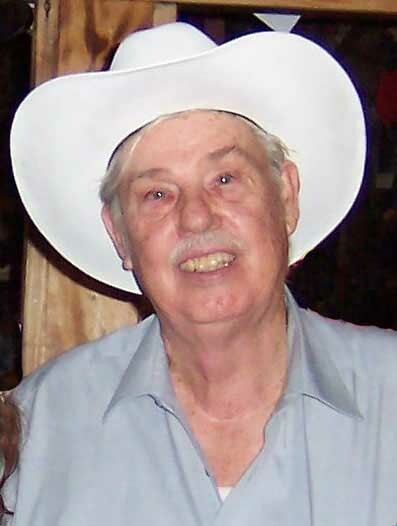 Born the son of a famous Hollywood actor, Buck grew up on movie sets, watching his father, celebrated actor Dub Taylor, appear with such movie greats as John Wayne, Tex Ritter and Bob Wills and the Texas Playboys. 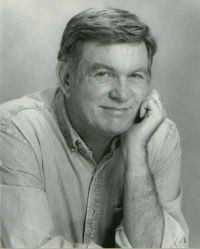 Buck took up the family business and appeared in everything from the Adventures of Ozzie and Harriet and My Favorite Martian to the classic period westerns, including Have Gun Will Travel with Richard Boone, The Rebel with Nick Adams and Bonanza. 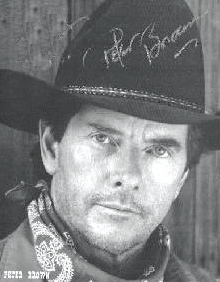 He is best remembered for his eight-year run as Newly on Gunsmoke, which ended in 1975. 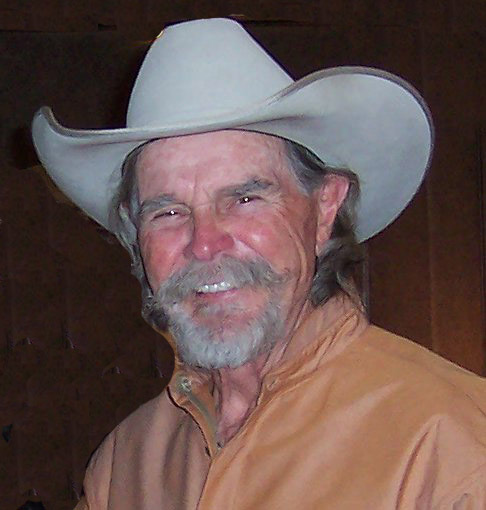 Buck appeared in other popular shows including Wagon Train, The Virginian, Dallas, and Walker, Texas Ranger. 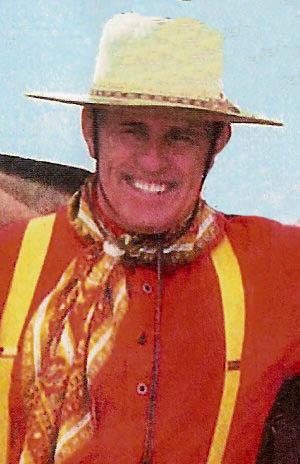 American television and film actor who has appeared in over 128 productions including his famous role in The Cowboy's where he killed John Wayne's character. 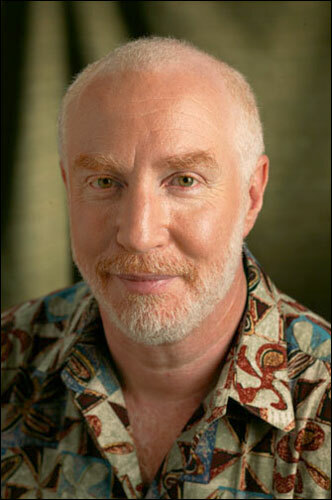 Dern is generally regarded as a character actor. He has a reputation of playing unstable and villainous characters, although his best-known role may be that of Freeman Lowell, the caretaker of Earth's last forests in Silent Running. American actor best known for his starring role as Wyatt Earp in the ABC television series The Life and Legend of Wyatt Earp (1955–1961). His Hugh O'Brian Youth Leadership (HOBY) non-profit youth leadership development program empowers 10,000 sophomores annually through its over 70 leadership programs in all 50 states and 20 countries. Since its inception in 1958, over 355,000 young people have been inspired by HOBY, including Gov. Mike Huckabee. John Wayne Anderson has a gift for voices and takes his impersonation of John Wayne his hero to a new level. He portrays John Wayne in a dignified and respectful way as the Duke would want it done. And his frequent appearances and education of young people not familiar with the Duke's history keeps the Duke's spirit alive for another generation to appreciate. 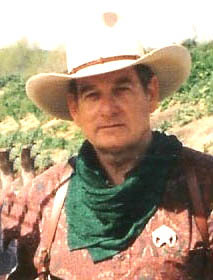 Lee is an Educational Living History Re-enactor, located in Central Arizona. He will take you back to relive Arizona’s Territorial Days. Watch and learn as this working cowboy and his horse Dusty perform in Living History. 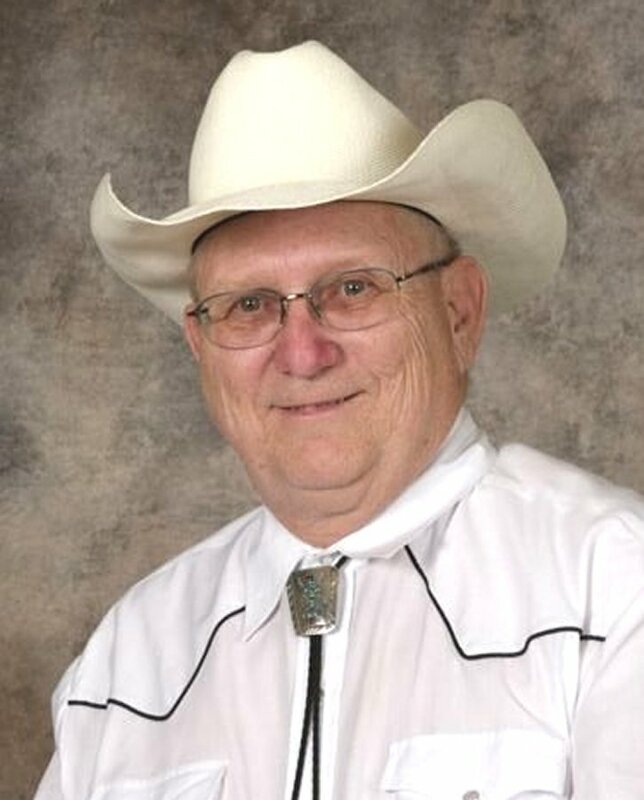 Lee has nurtured a lifelong interest in early southwestern U.S. History, antique firearms, western clothing and horses and their training. Additionally, over the years Lee has developed various skills in metal fabrication, leatherwork and woodworking, that lend themselves to making much of his equipment, clothing. His talent in horsemanship rose to the national competition level. 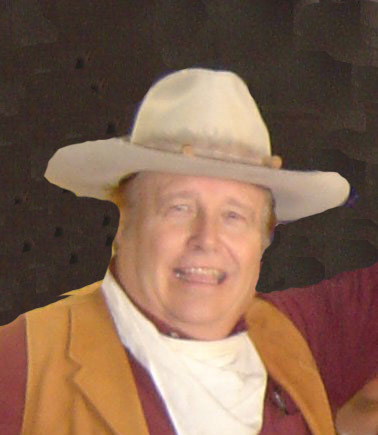 Most recently as Executive Director – Pioneer Living History Village, he helped establish it as true living history museum. Lee and Dusty participate in as many parades and western events as possible, where you'll usually see them carrying the National Day of the Cowboy flag. They present a striking image with their historic costumes and tack, and Dusty clearly loves being the center of attention as he dances under the National Day of the Cowboy's official banner. 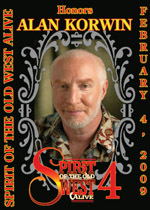 Lee began promoting the National Day of the Cowboy long before he became an official spokesperson. Wyatt McCrea helps preserve the dream of his famous grandparents, actors Joel McCrea and Frances Dee by preserving the large ranch they established at the edge of the Conejo Valley. The McCreas devoted time and effort to help people in Camarillo, Moorpark and Thousand Oaks. Dee honored her late husband’s final wishes and donated the remaining 280 acres of the ranch property to the Conejo Parks and Recreation District. Now McCrea’s descendents and the park district are planning to use the ranch for the benefit of school children and preserve the open space for wildlife. 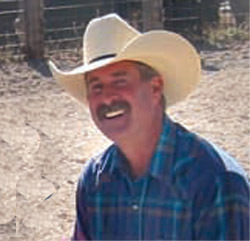 The ranch is still inhabited by Wyatt McCrea.Wyatt serves on the community advisory council for the Boys & Girls Club of Camarillo. He’s also on the board of directors for Ride On, a group that helps physically-challenged children and adults ride horses. Wyatt also is on the executive committee of the Golden Boot awards, an organization that honors current and past actors in western productions. 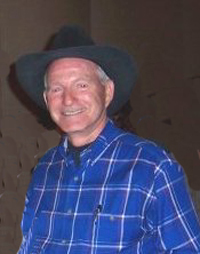 He serves on the National Cowboy and Western Heritage Museum board in Oklahoma City. 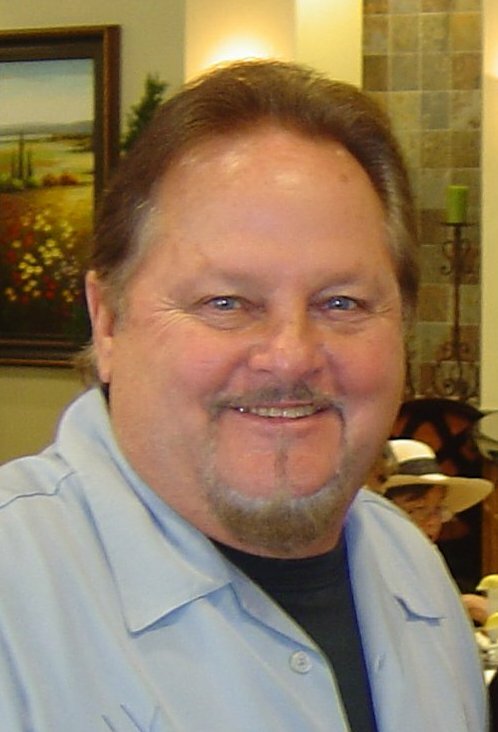 Sandy has played a number of roles in movies including Tombstone, Tin Cup, Lightening Jack & Used Cars. Sandy’s TV credits include The Wallace and Ladmo Show, Channel 5 News Anchor, Dialing for Dollars as well as working on-air at KOY. Sandy’s talent and experience always makes for a great show.. Sandy is a veteran actor with 50+ films under his belt. 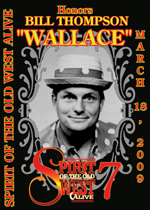 For 35 years Wallace has entertained Arizona with his wit and humor making him one of the most loved people in the state. He joined a number of regulars from the Wallace and Ladmo Show to remember good times from all of those years and even acted out a skit or two. Ladmo bags were won by a few lucky audience members! 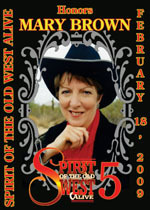 Mary Brown founder of Festival of the West has certainly contributed to keeping the spirit of the old west alive! She joined us as we discussed her life and the last 19 years running the largest and highest rated western festival in the country. Alan Korwin wrote his first book, The Arizona Gun Owner’s Guide, in 1989. It is now in its 23rd edition with more than 100,000 copies in print. He went on to write or co-write seven more books on gun laws, including state guides for California, Florida, Texas and Virginia, the unabridged federal guide Gun Laws of America, and his 11th, which debuted at the 2008 Gun Rights Policy Conference, The Heller Case: Gun Rights Affirmed! With his wife Cheryl he operates Bloomfield Press, which has grown into the largest publisher and distributor of gun-law books in America. 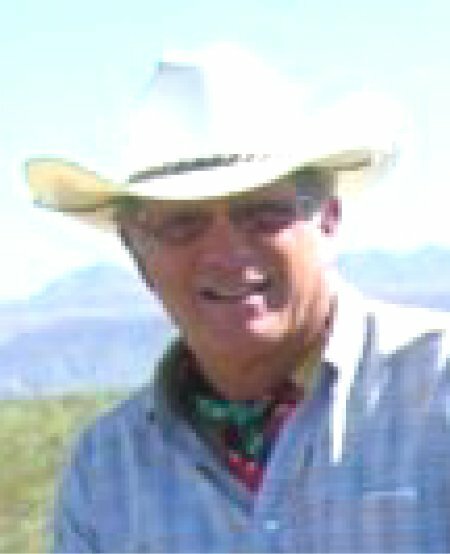 His website, gunlaws.com, features a National Directory to every gun law in the country and more than 160 books and DVDs for gun owners and the freedom movement. Alan’s blog, PageNine.org, is carried by dozens of paper and online outlets, and rumors about his political parody band, The Cartridge Family, cannot be confirmed. 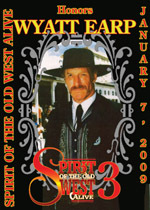 Wyatt Earp portrays his ancestor the famous lawman in his docudrama one man shows written by his talented wife Terry Earp. The family resemblance along with a tremendous gift for projecting the speech and dialect one would image Earp should have, make his portrayal especially engaging. 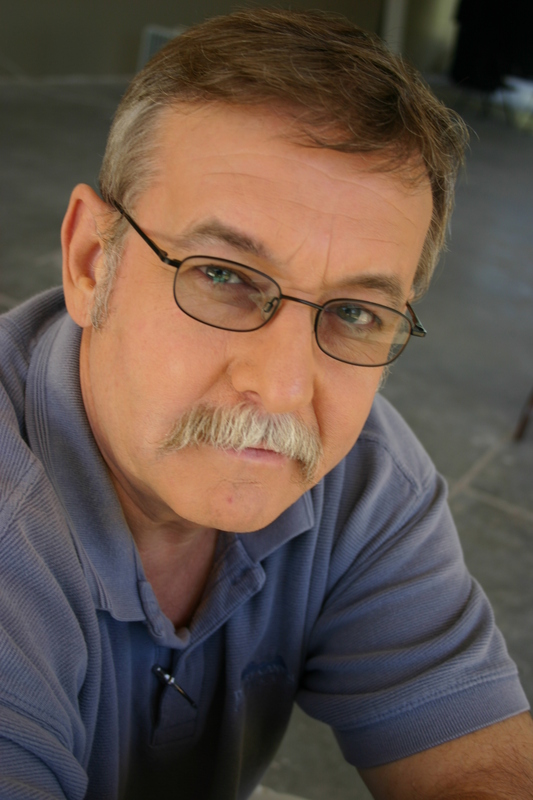 Bob Boze Bell is the Executive Editor of True West Magazine. He's also a talented artist, cartoonist and humorist. Tie that in with lifelong historian and you have an interesting package of talent that fills the desires of many an arm chair old west buff every time the True West Magazine hits the stands. 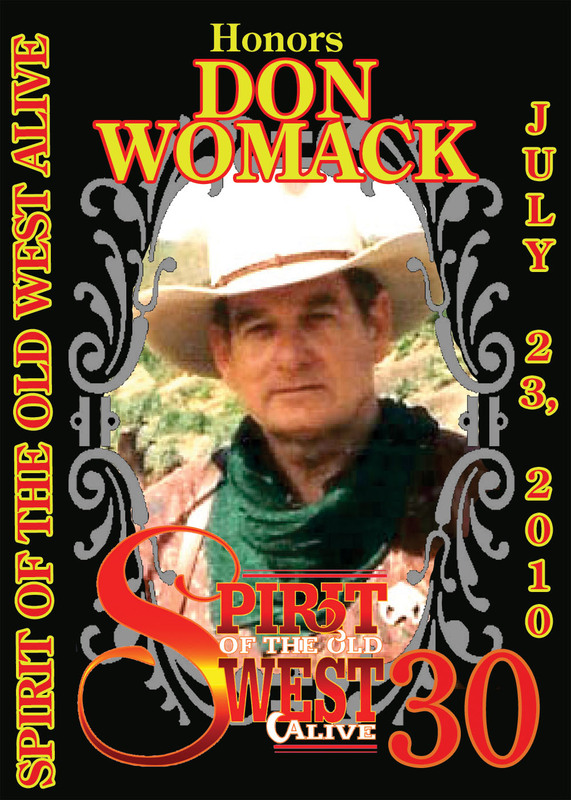 Plan to attend the Wild Western Festival to see this years awards! Thank you to all of our past very special sponsors! Thanks to Macayos for sponsoring SOWA. Check out their at www.macayo.com . Thanks to FIVE STAR PUBLICATIONS for sponsoring SOWA. 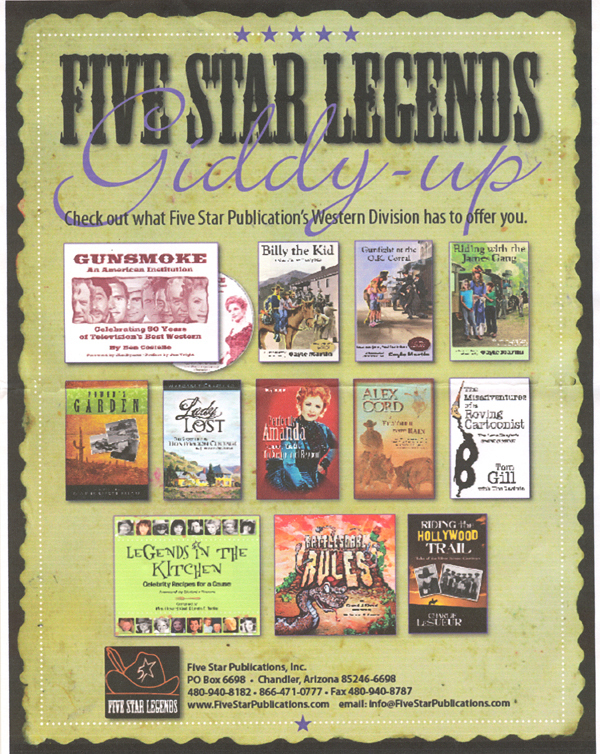 Check out their wide variety of books of interest to western aficionados at www.fivestarpublications.com . August honoree is among their authors and I strongly encourage you to pick up her books for the young people in your life. 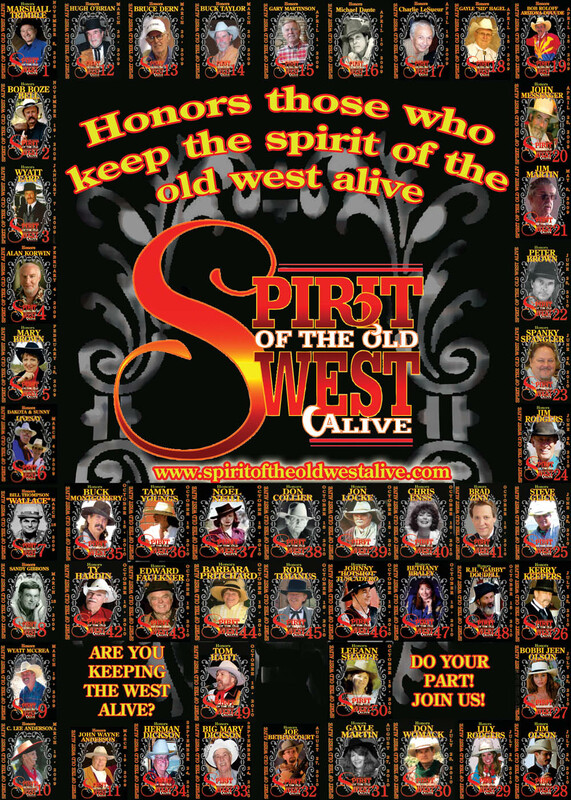 It will help keep another generation interested in keeping the spirit of the old west alive! 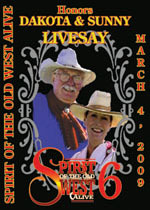 azkangen.com Thanks to azkangen.com for financial support of the Spirit of the Old West Alive project over the years. Thanks to Keith James we had the use of the beautiful Kangen Mansion (former home of John & Cindy McCain) where we had a theatre in which we presented the June 2010 SOWA interviews. Please take the time to thank Keith and drink some healthy water. It might be the best thing you ever do for your health! Thanks to Bison Western Museum and the generous support of Gary Martinson of Bison Homes and Nancy Moricchi we have a theatre in which to bring you these interviews. You can still purchase the collector tickets to help raise funds for this organization. Order here. Sue Thompson has her hands full with 65 PMU horses rescued and being rehabilitated at Dream Chasers Horse Rescue in New River. Her 501C3 organization is one of the beneficiaries of this events charitable donation. If you love horses, please be supportive of her efforts now and in the future. You can still purchase the collector tickets to help raise funds for this organization. Order here. 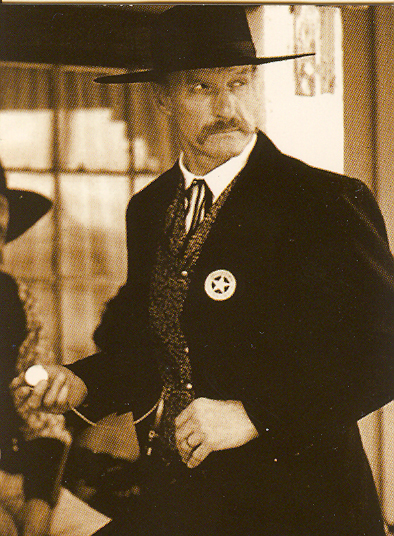 Wyatt Earp teaches at the YMCA and knows the true values this organization instills in the youth of America. It's only one example of why Wyatt is a person who keeps the spirit alive in Arizona and is a major asset to this project. Dwayne L Ernest the owner of Woodcraft has provided natural mesquite wood from Arizona for the beautiful plaques. Susan Engle owner of A2Z Trophy is the doing the laser etching and brass plaques on our Arizona plaques. Their top quality work completes the exceptionally beautiful design of the custom trophies to be given to our honorees. How can you become a sponsor? It's easy! Just give us a call and we can offer you opportunities to become involved in this exciting historic project! You will be listed on our website, in the program and in the videos. And you earn our deepest heartfelt gratitude! 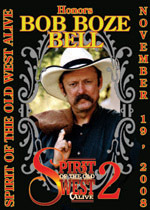 © 2010 Spirit of the Old West Alive!